Buddhists go to temple, not at a special time or day, but when they can. It is commom for Buddhists to go on a full moon day. A Buddhist temple is called Vihara and is a place for education. In a temple, you will find a shrine room with a large Buddha and statues of his disciples.You will also find relics and manuscripts. There is also a lecture room, meditation room and a library. Shoes are removed before entering a temple for respect for Buddha. Buddha is known as a teacher not a god. Buddhism means system taught by Buddha. Buddhism is further dived into the Mahayana, Theravada and Najrayana sects. 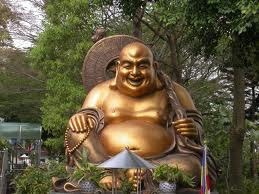 The religious leaders of the Buddhists are called Monks. The three jewels or three refuges of Buddhism are - The Buddha, the Sangha or the monastic community and The Dharma or truth or teachings. The four noble truths of Buddhism are - Life is filled with suffering, this suffering is caused by human desires and attachments, suffering can be eliminated and this can be done by following the Eight-fold path. The four reminders of Buddhism are - Human life is precious, death is inevitable, the laws of karma cannot be avoided and suffering permeates all existence. The noble eightfold path is - Right beliefs, right aspirations, right speech, right livelihood, right conduct, right effort, right mindfulness, right meditational attainment. The four Bodhisattva vows are - I vow to rescue the boundless living beings from suffering, I vow to put an end to the infinite afflictions of living beings, I vow to learn the measureless Dharma-doors and I vow to realize the unsurpassed path of the Buddha. Buddhism is a religion which believes in Nirvana or rebirth, which is seen as a halt of suffering by some whereas others look upon it as a heavenly paradise. The sacred text of the Buddhists is known as Pali Canon or Tripitaka. There are also various Mahayana sutras. The eight auspicious Buddhist symbols are - The parasol (chattra), the golden fish (suvaranamatsya), the treasure vase (kalasha), the lotus (padma), the conch shell (sankha), the endless knot (shrivasta), the victory banner (dhvaja) and the wheel (dharmachakra). Candles and incense sticks are lit and Buddhists recite verses in the Vihara. Flowers and food are placed on the front of the Buddhist Statue. The flowers are to remind the person that they will not live forever. The following principles are said to help Buddhists to act well: 1. Not to hurt living things, 2. Do not take avantage of what is not there, 3. Use senses correctly, 4. Speak kindly, and, 5. Do not take or use drugs or alcohol.